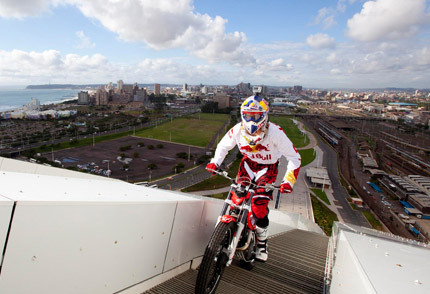 Ten time South African Supermoto Champion and master of the Trials Bike, Brian Capper traversed the arch of the Moses Mabhida Stadium on Friday 2 December 2011on his motorbike – defying the force of gravity. 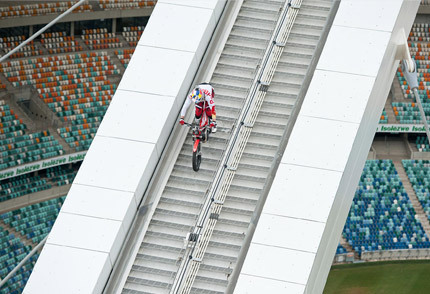 The 350-metre long and 106-metre high arch is the largest of its kind in the world, with 550 stairs from base to the top; setting a massive challenge for Capper to overcome. Capper was excited about his achievement. “For months now; it’s been a process of getting my mind around the magnitude of doing this. Before today the most stairs I’ve climbed is 20. And now I’ve accomplished it. It’s a pretty awesome feeling”. 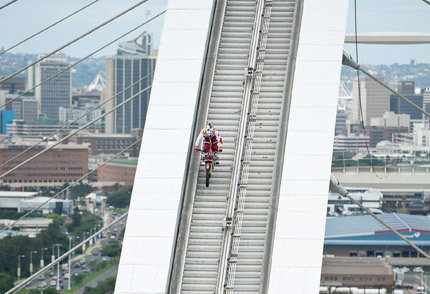 Brian rode his 2012 Beta Evo 300 Trial Bike over the arch. Weighing only 65kg the speciality bike was perfect for the task at hand, as a regular motocross bike would have made it impossible to maintain momentum on the ascent. General Manager, Imraan Mahomed said: “When Brian’s team first approached us, we thought it was madness. But we worked closely with the team to ensure the stunt was safe and achievable. 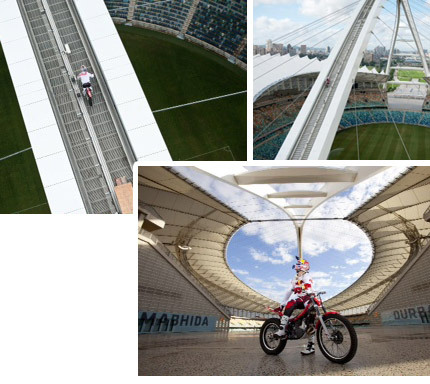 We identified strongly with Brian’s adventurous spirit since this is a stadium that promotes and hosts a range of unique adrenaline experiences including the SkyCar, Big Swing, Segway Gliding Tours and the Adventure Walk up the stadium’s arch. 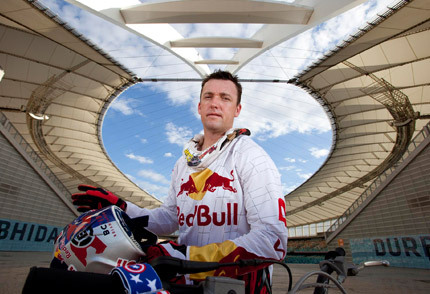 Sam Clark Red Bull Photofiles. Tyrone Bradley Red Bull Photofiles.